Britt Assombalonga celebrates another Posh goal. 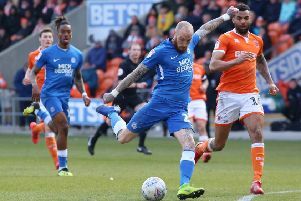 Peterborough United are staying silent on any cash windfall from the big money sale of their former striker Britt Assombalonga to Middlesbrough yesterday (July 17). The 24-year-old joined Boro from Nottingham Forest for a Forest club record sale of £15 million. Posh chairman Darragh MacAnthony won't be drawn on the amount his club will receive from the big-money sale of Britt Assombalonga. Posh chairman Darragh MacAnthony has confirmed to the Peterborough Telegraph that his club are entitled to a percentage of the profit Forest have made on the transfer. But he has declined to reveal a precise figure. “We do have a sell-on and it’s never enough!” said MacAnthony. The Nottingham Post is speculating Posh are in line for 20% of the profit. If true that would mean £1.9 million to Posh who sold Assombalonga to Forest for a reported £5.5 million in August 2014. It’s likely the percentage is less than 20%. MacAnthony confirmed on Twitter last night the money would be ploughed back into the club. Assombalonga scored 33 goals in his one full season at the ABAX Stadium after moving from Watford for a Posh record transfer fee of £1.25 million. Posh paid Watford another £1 million plus when Assombalonga moved to Forest as part of their original deal. Assombalonga scored 30 goals for Forest in 69 appearances (50 starts).